As someone with a creative background primarily focused in writing, I'm sensitive to the role of text (note: this doesn't mean I'm a master; in fact, I'm going to provide you with some examples of text gone wrong from my own work). 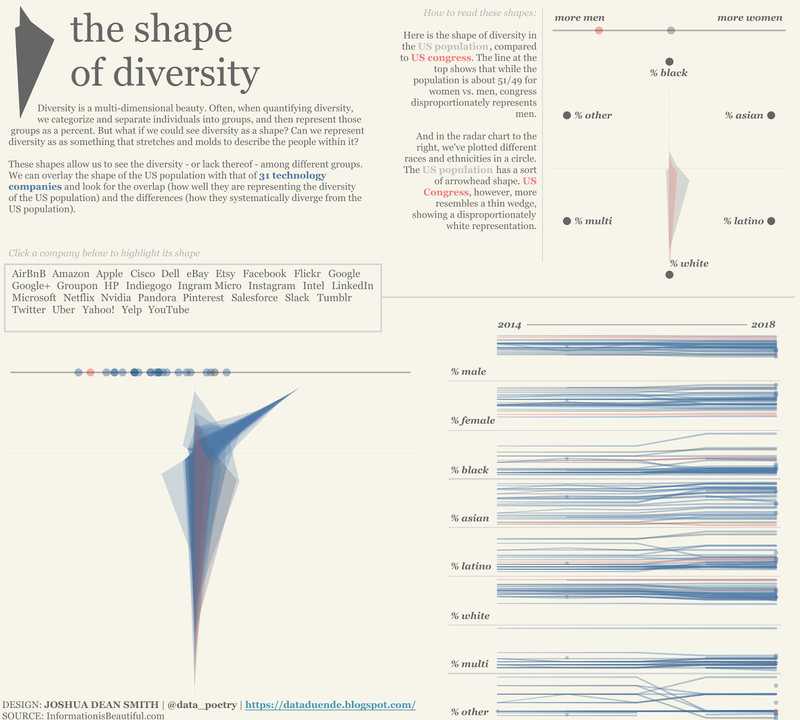 I've already written a bit on text: the concept of enjambments and how we end a line can confuse readers, and the power of a single word to change the entire strategy and theme of a viz. 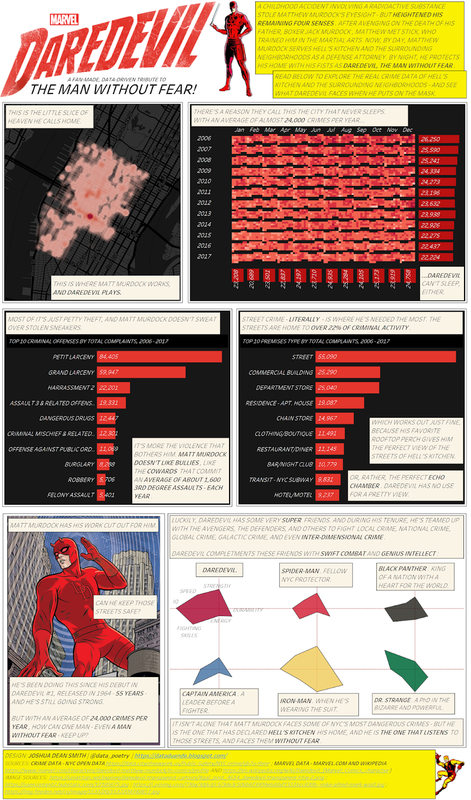 But for this post, I wanted to take a more holistic look at how text enhances (or hinders) a narrative, especially after making a few comic book vizzes that really challenged my use of text. Notice something about the text? I started with a massive chunk of text at the beginning. Seriously, who the hell did I think would read that? I see long, wordy intros like this all the time -- and I rarely ever read them. It's a huge mistake in much of my past work. I can't speak for everyone, but for me I think it boils down to an overestimation in how interesting the "backstory" is, and then a poor execution in providing that backstory. 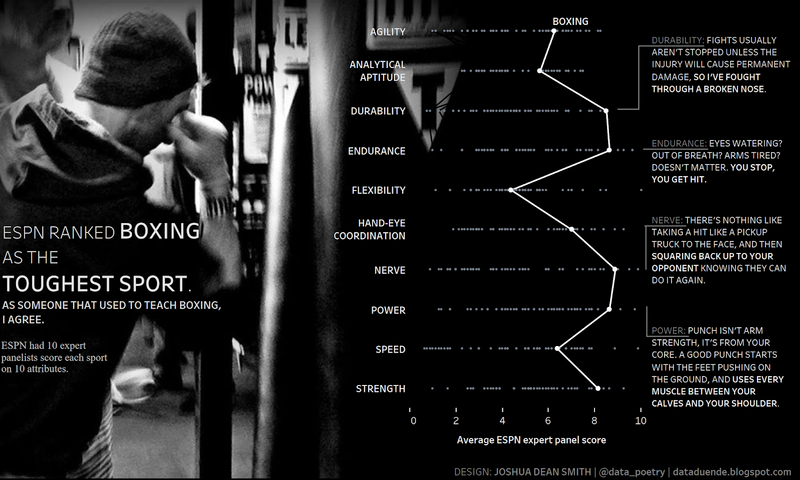 Take the boxing example above: I have a strong background in boxing. My great grandfather was a professional (with a record of 20 wins and 0 defeats! ), my grandfather fought amateur, my dad fought club, and I sparred and taught. I have a strong connection, and I wanted to share that. Without earning the audience's attention, I dove right into something personally interesting and my connection. The result? A big blob of text that actually drives people away from the parts they may find more interesting. I've failed to connect the audience to my viz, I only connected myself to it. In effect, this huge chunk of text immediately excludes them. Really, at the end of the day, this is all an attempt at exposition -- filling the reader in on the backstory. It's one of the most common criticisms of movies: "the beginning was really slow", or "they stopped the action to spend 15 minutes of dialogue to explain the backstory". Exposition is really tricky, and possibly the worst thing we can do is delay all movement in our plot to catch our audiences up. We have to earn the exposition by weaving it in. Check out my quick redesign. I'm still not happy with it, but the use of text is much improved. Part of it is the introduction of stronger design elements and more attention to aesthetics, which earns more text. Another part is that I cut a lot of the text out. You just didn't need everything I gave you. And, most importantly, my personal backstory is woven into the design, not a separate part of it. In a sense I'm earning (or at least working to earn) the exposition with stronger visual design, and enhancing the story with backstory, rather than delaying it. Comics are brilliant with their use of text. It's really rare to get a blob of text -- visuals are the primary focus of comics. Text is used to guide us from one visual to the next, to fill in the story between panels, and create dialogue. I've never seen a panel that's just a blob full of expository text; exposition is built into the design. Want to know how Storm discovered her powers? Here's a few panels on Professor X meeting her as a worshiped Goddess in the Serengeti, with some dialogue between the two. Comics will often have a brief intro -- which you'll see in my designs below -- but they are written in a sort of "on the last episode of..." format. If you aren't familiar with Daredevil, here's the executive summary. If you are familiar...skip and proceed. When I released my first comic viz, the most common compliment I received was "it reads like a comic", which I loved hearing. It meant my design strategy had been successfully executed. So, what did I do different? The beginning exposition was short, concise, emotive, and...invited users to skip it. I spent hours on this copy alone, editing and re-editing. I shoved in strong, emotive language to make it exciting. I kept cutting things down. And, I bolded the key points (like comics do), and then separated out the part that helps you understand the data part of viz. If you didn't want to read it, you could skim and grab the bolded section and read the smaller box...and move on. If you did want to read it, I spent a lot of time to get the narrative in the copy exciting enough to pull you through it quickly and efficiently. I worked in language that fit the themes and design strategy. This reinforced the design and Daredevil as a character. "Little slice of heaven" vs. Daredevil. "City that never sleeps" and "Daredevil can't sleep either" reinforcing Daredevil's difficulty tuning out his heightened senses. "View..." and "echo...". You get the point. I used each box to set up the next. This took a lot of work. I spent a lot of time tweaking the text so that you could just read the text and it would feel like a complete narrative on its own, but yet it's core function was enhancing the visuals. It was a really tricky balance, but using ellipses "..." and the comic book version of the emdash "--" really helped build anticipation for what the next box was going to say, getting you to move from one panel to the next. I focused on the tone and voice. Too often I feel like data viz is hyper-analytical, with an attempt at being purely observational and empirical and, ultimately, unbiased. I know that was the tone I tried to carry before, but the problem is that I would often remove all personality from the viz and make something...boring. I reread a lot of Daredevil comics (mostly Frank Miller's reboots) to capture the right tenses, verbs, pronoun use, sentence structure, etc. I edited and cut...and edited and cut...and edited and cut. I can't stress this enough, I felt like I was writing poetry again. I spent hours on the text, even outside of Tableau, just writing phrases and rewriting them in a notebook throughout the day as ideas would come to me. 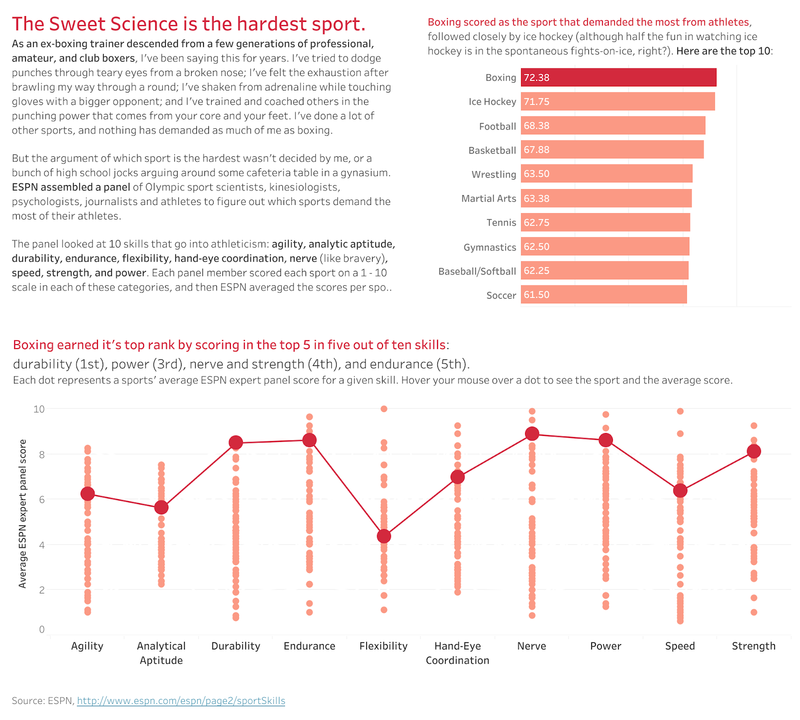 I evaluated the value of every single word, even the articles. And I still don't think it's done. It won't ever be, not in my mind. But it's done enough. Text is hard. What's easy is turning a visual design into a blog post, slopping words all over a page. What takes time is the agony of giving every single word attention, even those words that feel like they are a tedious but necessary part of a sentence structure. But do you really need "the" or "a", or can you skip what is traditionally a necessary part of grammar and maintain [or create] your tone and voice? It's difficult, but it's worth it. Hearing people tell me that my comic vizzes carry the voice and tone of a comic made every minute spent on each word worth it. That extra time is the difference between creating a boring exposition in your story, and bringing the characters and events in the data to life with the right design choices. Using data to see the world a little bit differently. Thoughts are mine only. Love y'all.